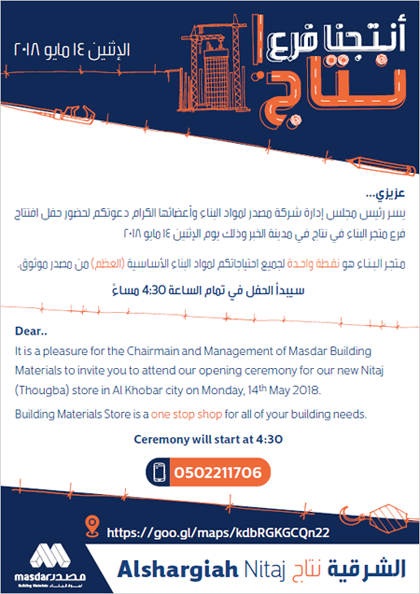 In Masdar Building Materials Group, we know how the businesses are running, and what could achieve the sustainable growth and leadership for the corporate. Our final objective is to enforce the competitive edges of our clients on the long terms aspects. Our challenges for the current situations are emerged from deep understanding to our clients’ commercial ambitions, and to work hard to overcome such challenge. We always seek and work to hire the best human resources from all over the world, to become an integral part of our vision. If you feel the interest and have the ambition at the same time searching for a job that can help you in achieving your personal and professional ambitions, please don’t hesitate to call or communicate with us on jobs@mbm.com.sa to achieve our vision, we need to acquire and develop determined characters like you and at the same time to retain them.